The strongest rider in Paris-Roubaix was Fabian Cancellara. The fastest was John Degenkolb. The most aggressive was Tom Boonen, or maybe Peter Sagan. And once these four had cancelled each other out, Niki Terpstra won. Why Terpstra? When the final, every-man-for-himself attacks went on the Carrefour de l’Arbre, the final significant sector of cobbles in the race, he’d been distanced. It’s true that he was part of the strongest team in the race, Omega Pharma-Quick Step, but that doesn’t tell the whole story of his victory. In the end, Terpstra won the race because of one simple and mundane fact: he was stronger than Giant rider Bert De Backer. Five riders had survived the Carrefour de l’Arbre at the front: Fabian Cancellara (Trek), Sep Vanmarcke (Belkin), Peter Sagan (Cannondale), John Degenkolb (Giant) and Zdenek Stybar (Omega Pharma). But the composition of the group was unsatisfactory – with Degenkolb and Sagan both lethal in a sprint, the other three weren’t convinced enough to press on. The coalition between these five was fragile enough that the next group, six riders, was able to slowly pull back. Joining the lead group: Degenkolb’s team-mate Bert De Backer, Geraint Thomas and Bradley Wiggins of Sky, Stybar’s team-mates Tom Boonen and Terpstra and Sebastian Langeveld of Garmin. That made 11 riders. But the composition was still wrong – nobody wanted to sprint against Degenkolb and Sagan. However, the difference now was that there were the numbers to do something about it. With just over six kilometres to go, Terpstra made his move. The others, rightly or wrongly, looked to Giant to chase, and De Backer wearily set off in pursuit, nine riders glued to his wheel. There were at least five riders stronger than Terpstra in that group, but the crucial fact was that it wasn’t any of them chasing. It was De Backer, and he was unequal to the task of pulling the Dutchman back. Five kilometres to go, and Terpstra’s lead was 10 seconds. Four to go, 15 seconds. Three to go, 20 seconds, in spite of Thomas contributing to the pacesetting. That was enough. Terpstra, whose attack had initially looked like a triumph of willing mind over unwilling body, now looked uncatchable. Behind him, Degenkolb showed why the others had been so worried about him by duly sprinting in for second, while Fabian Cancellara maintained his peerless record in the flat Classics by coming third. Some of the riders in the top 10 will be kicking themselves that they didn’t follow Terpstra’s attack. Degenkolb, Sagan, Cancellara or Vanmarcke would never have been allowed to counter without a full and co-operative reaction from the rest of the group, but Thomas, Wiggins or Langeveld might have been successful in such an enterprise. Of course, it’s possible that they were too tired, but at this point the race had ceased to be a battle of strength, and had become one of tactics. The defending champion Cancellara, for his part, was unable to impose himself on the race. A combination of his rivals working him over and a weaker team left him on the back foot almost all the way through. Omega, Sky and BMC all used their numbers to push the momentum of the race up the road away from the Swiss rider. Boonen, Hushovd and Thomas’s attack at three-quarters distance forced Cancellara to use up what domestiques he had left to chase. Then Peter Sagan went for it before Boonen and company had even been caught. It meant that when Cancellara’s lethal acceleration on the Carrefour de l’Arbre was unleashed, he came out of it with four riders still with him. A week previously at Flanders, a similar thing had happened, but he’d been confident of outsprinting his three companions. This time, with Degenkolb and Sagan, then Boonen, for company in the finale, he couldn’t be so sure. 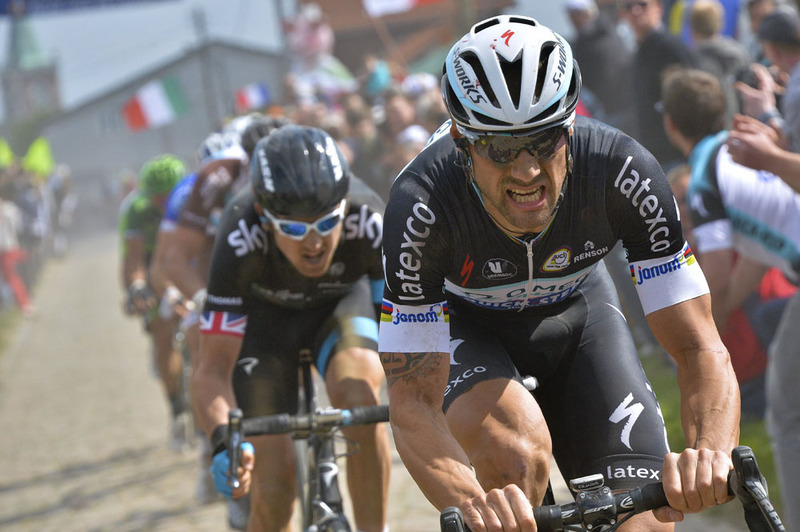 At the Tour of Flanders, the strongest rider in the race, Fabian Cancellara, beat the strongest team, Omega Pharma. At Paris-Roubaix, it was the opposite. Omega Pharma, who’d crowded the top 10 of Flanders while never looking like they could convert that into a victory, did the same at Roubaix. This time they won. This was a Paris-Roubaix whose shape constantly changed. The last quarter was filled with constantly shifting alliances, with the balance of power swinging wildly like a pendulum. If Heisenberg’s Uncertainty Principle could be applied to this race, it would state that at any given moment, it was impossible to know simultaneously what the shape of the race was and in which direction the momentum was moving. Boonen, Hushovd and Thomas’s attack with 65 kilometres to go(which also included De Backer) was not an all-out effort at victory, but they chiselled out a lead of almost a minute. It was interesting that Boonen had been sent up the road. At Flanders, Omega Pharma had used Stijn Vandenbergh to cover the attacks in the closing phases, only for one of them to stick, and for him to come a distant and inevitable fourth in the sprint. Here, Omega brought out the heavy artillery much earlier – an adaption of tactics which ultimately contributed to their winning the race. There was no point in trying the same thing again. The Boonen group’s lead was halved in the five-star Mons-en-Pevele sector as Vanmarcke and Cancellara went on the attack. But they couldn’t put a decisive gap between themselves and the riders behind, and the gap to the front group stubbornly stuck at half a minute. Trek simply didn’t have the numbers to chase effectively, while the other important teams – BMC, Sky and Omega – already had riders up front. Belkin were also phenomenally strong, but they were content to mark Cancellara, rather than use themselves up in the chase. Then Peter Sagan attacked, followed by Belkin’s Maarten Wynants, and they were let go. While Cancellara couldn’t move from one side of the road to the other without several riders tracking him, Sagan, an unknown quantity in this race, was allowed a surprising amount of freedom. It almost all came together on sector six, starting at Cysoing. Sagan and Wynants just about made contact with the leaders, while Cancellara and Vanmarcke approached fast from behind. But Sagan went again, almost immediately, this time on his own. Behind him, the lead group had been eroded down to 10 riders, who resembled a club run of fourth category riders – some pulling through too hard, then sitting up, others drifting through. Sagan therefore started the crucial Carrefour de l’Arbre sector in front. When Cancellara forced his way through to join him, with Degenkolb, Vanmarcke and Stybar for company, the five strongest riders in the race had finally emerged after an hour of politicking, tactics, false starts and shifting dynamics. The trouble was, now they held the balance of power, they didn’t know what to do with it. In previous years, Cancellara’s made his race-winning effort to ride away from his rivals. However, this year, he’d used it to catch them up, and it left him fatally exposed. Like a boxer softened up with jabs and body shots, he was finally knocked out with a sucker punch.